Child's Play is getting a remake. The 1988 horror classic that gave us the iconic slasher doll Chucky is getting the reboot treatment from MGM. Universal owns the home entertainment rights to the franchise and it's a tricky situation, but it looks like MGM, whose United Artists studio distributed the original movie, has found a way to separate the rights and is now looking to get this remake made in a hurry as the project is being put on the fast track. Director Lars Klevberg has been tapped to helm the remake. His biggest project to date is the upcoming horror flick Polaroid, which was originally supposed to be released last year but hasn't hit theaters yet due to The Weinstein Company filling for bankruptcy. In any case, he's the man tasked with reinventing Chucky on the big screen for a new generation. According to a new report, this will be a contemporary reboot that will center on a group of kids, as opposed to just one, that come into contact with a technologically-advanced doll. Whereas the original Good Guy doll was pretty simple, save for being possessed by the spirit of a serial killer, this doll may have some more tricks up its sleeve. IT producers David Katzenberg and Seth Grahame-Smith are on board the project, which bodes well considering how well that movie turned out. Tyler Burton Smith penned the screenplay. He wrote the video game Quantum Break as well as the script for Kung Fury 2, which is currently in production. Filming on the Child's Play remake is slated to begin this September in Vancouver, Canada. That means we could see this thing realistically arrive in theaters in fall 2019. At the present time, it's unclear if Brad Dourif, who has voiced Chucky in every single one of the movies to date, will reprise his role. But since this is a reboot, it's not hard to imagine them recasting the voice. 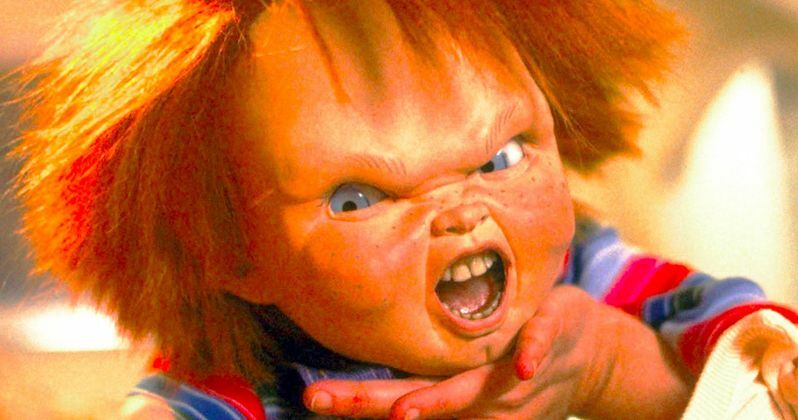 This news comes in the wake of news that franchise creator Don Mancini is moving ahead with a Child's Play TV series. That series will be picking up after the events of last year's Cult of Chucky, the seventh movie in the franchise that was arguably the best installment in years. Things could get a little complicated with both a big screen reboot and a small screen continuation of the horror series going at the same time, but it appears as though that's where we could be heading. No cast members have been revealed just yet but the project was being developed under a code name and it's being reported that MGM was hoping to pull off some sort of secret reveal, ala what Lionsgate did with Blair Witch from a couple of years ago, which explains the secrecy. The cat is out of the bag now though and we're likely to be learning more about the remake as it gets closer to production. We'll be sure to keep you up to date as more details on the Child's Play remake are made available. This news comes to us courtesy of Collider.